Oxygen is required by many organisms that use it primarily as an electron acceptor in the generation of energy. Too much oxygen can be just as detrimental as too little. 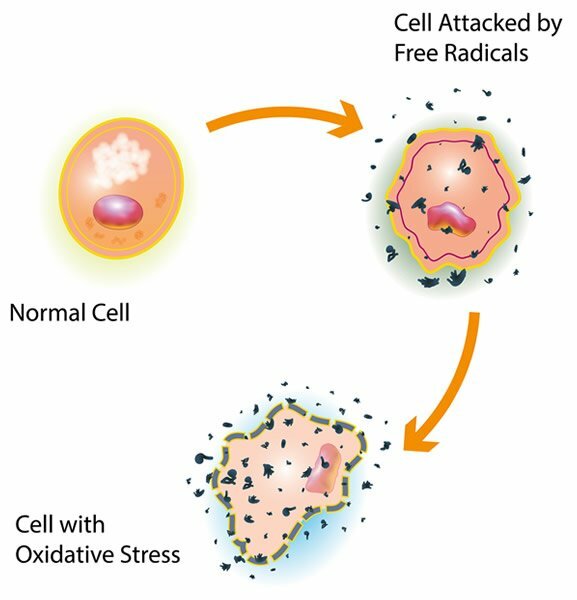 Various factors in the environment and in the cell can lead to the production of dangerous oxygen free radicals, which damage the cell; however, in the cell there are various enzymes designed to deal with these radicals. Oxygen in the form of ozone helps to protect life on the planet from harmful ultraviolet light. Carbon dioxide is a natural by-product of metabolism. As such, many think that it is useless. Nothing could be further from the truth: CO2 is essential to all life on earth. Carbon dioxide aids in the delivery of O2 to cells in the body and is responsible for maintaining a near neutral pH in the blood as well as in the oceans. It is essential to the process of photosynthesis by plants. Nitrogen is an essential component of many biomolecules such as DNA and proteins. 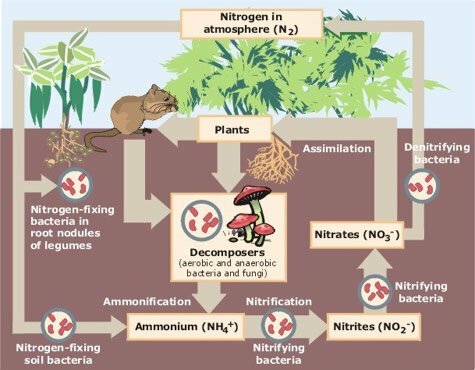 Nitrogen constitutes the bulk of the atmospheric gases, but animals have no way of directly tapping into this vast reservoir to obtain N2 for their synthetic needs. Rather, it is obtained indirectly through eating plants and other animals. The roots of many plants have bacteria with specifically designed enzymes to “fix” nitrogen converting the gaseous form into ammonia (NH3), a much more usable compound. All organisms need energy for growth and maintenance. Air-breathing animals, particularly those that are large and warm-blooded, have relatively high metabolic demands that require ample amounts of oxygen. Oxygen (Figure 1) has the highest attraction for electrons, or electronegativity, of all the elements except fluorine. This makes oxygen especially well suited as the final electron acceptor in the electron transport chain of mitochondria, a sub-cellular organelle known as the primary energy producer of the cell. When oxygen combines with another element, referred to as oxidation, more energy is released than when any other element combines, except fluorine. In the cell the energy released is slow and controlled. The process of oxidation involves removal of electrons from reduced carbon compounds. Ultimately, those electrons are combined with oxygen to form water. Before they are passed on to oxygen, however, they are used to do electrochemical work, which enables the cell to make chemical energy in the form of ATP. The more reduced a carbon compound is, the greater the energy obtained through its oxidation. The product of complete oxidation of reduced carbon compounds is water and CO2. Fatty acids are the most reduced molecules in the body, and when oxidized, the “metabolic” water produced can serve as the primary source of water for many organisms that live in arid regions. Carbohydrates (sugars) already have oxygen bound to carbons and thus are partially oxidized, but there is still sufficient potential energy in them to make them excellent reservoirs of potential energy for the cell. Figure 1 shows the molecular structure of diatomic oxygen gas. Note the double bond between the two oxygen atoms. Oxygen’s high affinity for electrons makes oxygen a strong oxidant, and thus quite reactive. However, oxygen gas in the atmosphere is present as a diatomic molecule, O2, making it less reactive at ambient temperatures. Cells have various enzymes that employ transition metals such as iron and copper, used to activate oxygen, making it more reactive. Our atmosphere contains ~21% oxygen. It is estimated that if it contained even 25%, compounds would combust too easily and wildfires would rage out of control; molecules in our tissues would also be oxidized too readily. The metabolic demand for adequate amounts of oxygen by warm-blooded animals is quite high. High metabolic rates require that there be an efficient transport and delivery system in place that can deliver the necessary amounts of oxygen. The blood is mostly watery plasma, and all cells of the body are bathed in a watery, interstitial fluid. The amount of gas dissolved in water, in part, is dependent upon its solubility constant, the partial pressure of the gas in the air with which the water is in contact, and the temperature of the water. Compared to CO2, the solubility of O2 is quite low (~3 mL O2/L of plasma at 37°C) thus in humans with ~5 L of blood there would be only about 15 mL of O2. At rest, cells consume about 250 mL O2/minute, and this may rise by 25-fold during exercise. Thus, not enough O2 can dissolve in the plasma to meet the metabolic demands of large, warm-blooded organisms. The Creator, however, designed a protein, hemoglobin, (Figure 2) that can bind oxygen reversibly and thus increase the O2-carrying capacity of the blood by about 75-fold. Approximately 98% of the O2 in the blood is bound to hemoglobin, with only 2% dissolved in solution. Binding of O2 to hemoglobin maintains a partial pressure gradient for O2 such that it continues to diffuse from the alveoli (air sacs) of the lungs into the blood. Oxygen must then diffuse from the blood into the cells of the tissues, thus the rate of diffusion of oxygen must be such that enough oxygen is delivered. The rate of diffusion is related to the solubility constant (0.03 mL O2/L•mmHg for O2 at 37°C); the greater the solubility, the higher the rate of diffusion. The average value for diffusion of O2 in normal human plasma, at 37°C, is 2.18 x 10-5 cm2/sec. If the rate were less than this, not enough oxygen could be delivered. Figure 2 shows the hemoglobin molecule (left) and the porphyrin ring (heme, right) which carries the iron (Fe2+) in the center. Note that there are four heme groups per hemoglobin molecule each with an iron atom. Thus each hemoglobin molecule can carry four oxygen molecules (O2). Image of hemoglobin by PatriciaR, via Wikimedia Commons; image of porphyrin ring by Yikrazuul, via Wikimedia Commons. Interestingly, there is evidence to suggest that ROS are used by cells to increase the production of enzymes that destroy them, thus making the body healthier even when not stressed. Also, ROS have been implicated in a number of cellular processes such as signaling pathways, regulation of protein channels and transcription factors, cell differentiation, the immune response, and a host of other activities. It seems that in God’s economy even harmful compounds can have value and purpose. Figure 5 shows the molecular structure of ozone. This are the two resonance structures for ozone. Image by Temp5psu, via Wikimedia Commons. 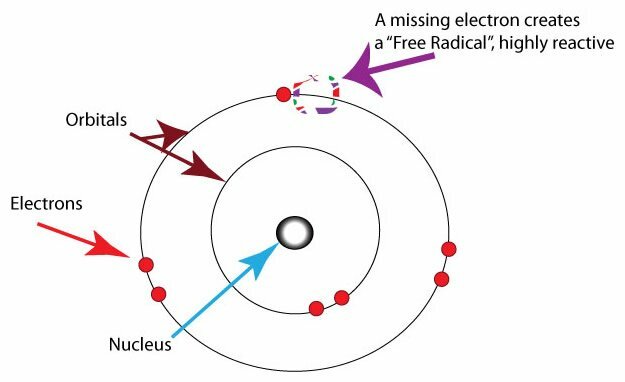 Figure 6 shows how a free radical can be formed through loss of an electron leaving behind an unpaired electron which is very reactive. Ultraviolet light at wavelengths <300 have enough energy to cause loss of electrons from oxygen atoms. Image by Healthvalue~commonswiki, via Wikimedia Commons. Michael Denton, in his 1998 book Nature’s Destiny (128), notes that the viscosity, density, and pressure of our atmosphere must be what it is, otherwise air-breathing organisms would not be able to survive, as taking a breath would be prohibitive. The total atmospheric pressure is 760 mmHg at sea level, the density at sea level is 1 gram/liter, the viscosity and the density are about 1/50th and 1/1000th that of water, respectively. If either were increased, the act of breathing would be more difficult as airway resistance would increase. If the atmospheric pressure were increased, the density would also rise, making it difficult to breathe. We see that oxygen, like so many things in life, is a good thing, but too much of it can be bad, and too little of it can also be bad. A delicate balance must be reached between too much and not enough. It is interesting that the level of O2 is just so that this balance is perfectly met. Coincidence? Carbon dioxide is a gas and is ubiquitous. (Figure 7) Along with water, it is the metabolic end products of the complete combustion of biofuel molecules by cells. In the atmosphere it constitutes about 0.04% of the total pressure, or about 0.228 mmHg. The solubility of CO2 in water is greater than that of oxygen; approximately 1.3 to 1.7 g CO2/kg water in the temperature range of 20 to 30°C. This means that CO2 gas can easily enter and leave water. Thus, wherever water is, there will also be CO2; the two are inextricably linked. In this way carbon can easily be distributed throughout the biosphere in the carbon cycle. Figure 7 shows the molecular structure of carbon dioxide. The average-sized person, via metabolism, generates about two pounds of CO2/day. If CO2 were not a gas, it would be virtually impossible to rid the body of this much metabolic waste. The gaseous nature of CO2 and its solubility in water allows the blood to transport large quantities of CO2 in the form of its hydrates, carbonic acid (H2CO3), and bicarbonate (HCO3-) to the lungs for disposal with every breath. Thus one metabolic end product, water, is used to rid the body of the other end product, CO2. For the sci-fi enthusiast, if life were based on silicon, silicon dioxide, SiO2, would likely be the end product of metabolism. This compound is a solid, and as such, it would be much harder to eliminate the large quantities generated. In addition, unlike CO2, SiO2 is not nearly as soluble in water. Consequently, it would take copious amounts of water to rid the body of an amount of SiO2 equal to CO2—another reason that silicon-based life is not feasible. The pH is a measure of the free proton (H+) concentration in a solution. The maintenance of a stable pH within bodily fluids and cells is essential to all life; virtually all life processes depend on stable pH conditions. Acids tend to give off H+s, and bases tend to pick up H+s. Thus it is imperative that there be some means to prevent shifts in pH that would compromise metabolic function; there must be compounds that can either give off or pick up H+s as needed in order to buffer against wide changes in pH. Large changes in pH can lead to denaturation of proteins, altered charge states of enzymes and/or their substrates, and cause proteins to precipitate out of solution. Metabolism tends to generate compounds that are acidic. Consequently, cells and body fluids would easily become acidified to the point that life would cease. 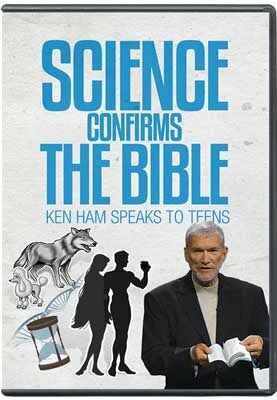 However, our wise Creator designed our systems such that the two end products of complete combustion of fuel molecules are the innocuous water molecule and CO2. When CO2 dissolves in water, it slowly forms H2CO3, which then spontaneously deprotonates to form HCO3- and a H+. Carbon, situated between boron and nitrogen in the periodic table, is unique in that its hydrates, H2CO3/HCO3-, occupy a “Goldilocks” position having exactly the right chemical properties that allow it to serve as an excellent pH buffer in the body, being able to give up or take up H+s as needed. Hydrates of boron are only very mildly acidic; not acidic enough to be useful as a pH buffer, and those of nitrogen are very acidic—too acidic to be useful. Indeed, no other hydrates of other elements, save that of phosphorous, have the ability to buffer pH within the constraints required by life. Certain species of phosphoric acid (H2PO3-/HPO32-) serve as a major pH buffer inside cells. In the body carbon dioxide diffuses down its partial pressure gradient from the cells where it is formed into the blood where it is converted to HCO3- or bound to hemoglobin. Conversion and binding to hemoglobin maintain a lower partial pressure in the blood so that CO2 will continue to diffuse out of cells. In the red blood cell, the enzyme carbonic anhydrase rapidly catalyzes the formation of H2CO3 from water and CO2. (Figure 8) The carbonic acid formed spontaneously deprotonates to form HCO3- and H+. The HCO3- is then transported out of the cell where it serves as the primary pH buffer in the blood plasma. The H+ is picked up by hemoglobin where it helps to stabilize the deoxy form of hemoglobin promoting O2 delivery to the tissues. Carbon dioxide bound to hemoglobin also helps to unload O2 from hemoglobin by further stabilizing the deoxy form of hemoglobin. 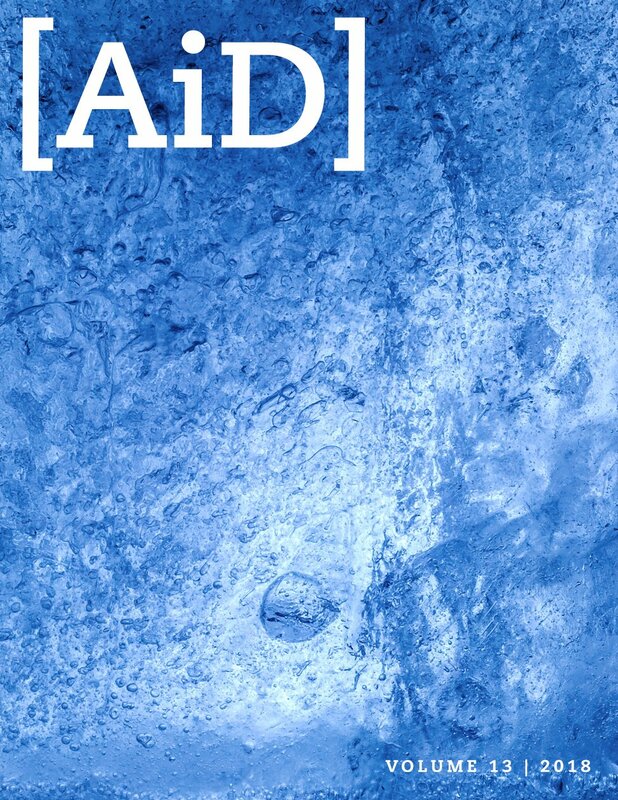 Thus, CO2, directly and indirectly, aids the delivery of O2 to the tissues. As Denton says, the carbonic acid-bicarbonate “buffer system is a paragon of elegance and efficiency which solves two basic and very different physiological problems—the ridding of the body of the end product of oxidative metabolism, and the maintenance of acid-base homeostasis in the same basic equation” (133). Figure 8 shows the reaction of carbon dioxide with water to produce carbonic acid which then deprotonates to form bicarbonate and a proton (H+). The enzyme carbonic anhydrase catalyzes the first reaction. Note that both reactions are reversible. This is crucial to the ability of the bicarbonate/carbonic acid system to buffer pH. Image by Schlenk, via Wikimedia Commons. Formation of carbonic acid from rainwater and CO2 in the atmosphere contributes to the weathering of rocks and the release of various metals and minerals contained therein. These can then be distributed throughout the earth by water and wind, making them available to life. The interaction of CO2 and water, forming H2CO3/HCO3-, is of extreme importance in maintaining the constant relatively neutral pH of all bodies of water on earth. The importance of CO2 to the process of photosynthesis by green plants cannot be overstated. If CO2 and O2 were not gases, the process as we know it would not be possible. Plants are the primary producers upon which almost all other life ultimately depends for sustenance. Here, again, the solubility of CO2 in water is crucial to the process as CO2 is “fixed” by being combined with other carbon compounds in the “dark” reactions to synthesize sugars. The “fixed” carbon comes from that dissolved in the water of the cell. Electrons and energy used in the synthesis are provided by photolysis of water molecules in the “light” reactions of photosynthesis. Gaseous O2 is released from water and escapes to the atmosphere for use in oxidative metabolism by aerobic organisms. This elegantly closes a loop in the carbon cycle between plants and animals. As with oxygen, the concentration of CO2 in the atmosphere, and its water solubility, must be such that there is enough CO2 to carry out photosynthesis, and maintain the pH of blood and bodies of water near neutrality, but not too much as to tip the scale and become toxic. Again, coincidence? Nitrogen (Figure 9) comprises about 78% of the atmospheric gases. Nitrogen is essential to life as almost all biomolecules contain nitrogen atoms. However, humans and animals do not have a means to extract it from the atmosphere and make use of it like we do with oxygen and carbon dioxide. Many plants, on the other hand, have nitrogen-fixing bacteria on their roots that can “fix” nitrogen by incorporating it into various biomolecules. (Figure 10) When we eat, we derive our nitrogen from the food, and are then able to generate many of our own nitrogen-containing molecules. Genesis 1 tells us the Lord created all plant life to be a source of food for all animals. This dependence is a design feature of our planet. After the Fall, some animals developed a need for other sources of nutrients, thus carnivory came about. Figure 9 shows the molecular structure of nitrogen gas. Note the triple bond between the two nitrogen atoms. Figure 10 essentially shows the nitrogen cycle and the role of nitrogen fixation by bacteria in forming organic compounds with nitrogen as a component. Image by Cisco79, via Wikimedia Commons. Virtually all of these interactions that we have discussed thus far also involve metals of one kind or another. Plants depend on certain metals for photosynthesis, and animals depend on some of the same metals for their metabolic processes. In the next article we shall take a closer look at some of these metals and their uses by plants and animals. I wish to thank Ms. Sabrina Hebron for her many helpful suggestions. Berg, Jeremy et al. Biochemistry, 8th edition. New York, NY: W. H. Freeman, 2015. Costanzo, Linda S. Physiology, 6th edition. Philadelphia, PA: Elsevier, 2018. Denton, Michael. Nature’s Destiny. New York, NY: The Free Press, 1998. Henderson, Lawrence J. The Fitness of the Environment. New York, NY: The MacMillan Company, 1913. John D’Orazio, Stuart Jarrett, Alexandra Amaro-Ortiz, and Timothy Scott, “UV Radiation and the Skin,” Int. J. Mol. Sci. 14, no. 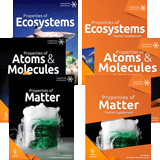 6 (June 7, 2013): 12222–12248, doi:10.3390/ijms140612222.